After recently writing about moving beyond the hype of social media and recruiting, I took some time to reflect quite a bit on the topic, and focused a critical eye on exactly what “Social Recruiting” is. While there is no shortage of what people think “Social Recruiting” is, quite frankly – I’m not satisfied with any of the definitions and explanations I’ve found – most are too surface level and one-dimensional, as well as inaccurate, in my opinion. It seems that a large portion of what many people seem to be happy to accept as “Social Recruiting” is really nothing more than traditional job posting and employer marketing and branding in a 2.0 environment. However, I can definitely appreciate the challenge of trying to nail down an accurate and concise definition of “Social Recruiting” – it’s quite the slippery fish. So rather than trying to answer the question of “What is Social Recruiting?,” I’m going to tell you what I think Social Recruiting is NOT. Posting job openings on Facebook, Twitter, and LinkedIn is not Social Recruiting – it’s simply posting jobs on social networking sites. Job posting is job posting – there’s nothing “social” about it, regardless of where the jobs are posted. @CMcKenzie77 Where’s the “social” piece if a company only posts jd’s & news releases? #socialrecruiting -Its missing conversation..Rt? @mysensay No, that’s just a corporate website or job board dressed up as a Twitter account. @aglogan No not IMO. Personally I don’t think it’s any different to advertising on a job board. The tweets offer no value. @tombolt There can be active or passive recruiting, but only using twitter passively is missing the point of #socialrecruiting. These talent acquisition professionals on Twitter all agree that just posting jobs and press releases on Twitter isn’t social recruiting. In fact, I did not receive a single response to the contrary. I particularly liked @jayveniard’s assessment that posting jobs using Twitter is social media marketing. I agree. Posting open jobs anywhere is simply promoting and distributing an opportunity for employment. Can anyone make a solid argument that posting jobs is “recruiting,” regardless of where the jobs are posted? Regardless of what you would like to label it – there’s nothing social about identifying candidates. You don’t even need to be human to source candidates from social networking sites – there are apps that can do that. Have a corporate Facebook Fan Page? Awesome! Have a bunch of cool “What it’s like to work at…” and community involvement videos, links to awards from major magazines, press releases, etc.? Great! However – is any of that really recruiting? Isn’t that just marketing and branding? Yes, it’s a no-brainer to have job search functionality directly on your Facebook Fan Page, to post jobs opportunities, and link to your corporate website from your FBFP. But job search, job postings, and website links do not a “Social Recruiting” strategy make. While the “Big 4” firms are often used as leading examples of how to leverage social media for recruiting, how “social” is it to only follow 15 people on Twitter? How about following only 1 person? Where’s the engagement and the 2-way communication? Wait – it gets better. Is it very social to only follow your own Twitter accounts? I won’t name names – you can do the research. You’ll be shocked. So if you have a corporate Twitter account and you don’t follow (m)any people, you don’t really respond to anyone, and you’re only posting jobs and content from feeds – how “social” is that? That’s called talking and not listening. Which is really interesting given that many Social Media “gurus” claim that one of the biggest opportunities presented by Social Media lies in listening. It’s currently popular to trash job boards, proclaim they are dying, and say that social media is delivering the coup de grâce, but job boards aren’t going anywhere. You see – for all of their supposed flaws, job boards actually serve a purpose. It’s simply convenient to go to a place and find a large collection of jobs to search through. Sure, you can use any search engine to look for jobs, but that actually doesn’t make much sense. Why use an Internet search engine to search for jobs? 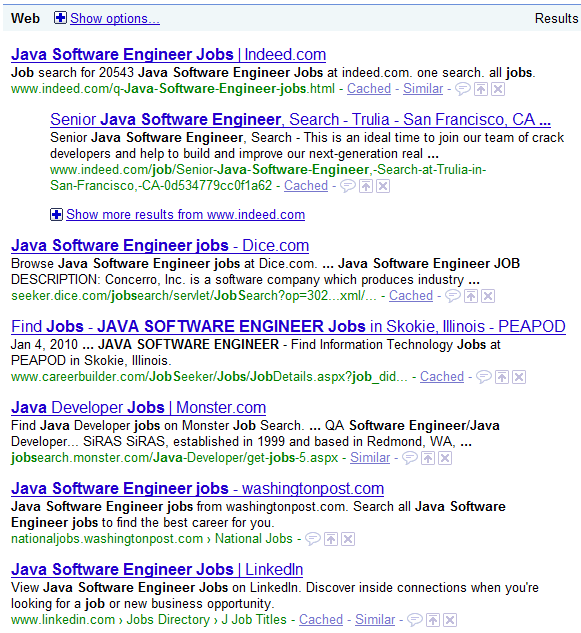 Try going to Google anyway and enter something like: Java Software Engineer Jobs. Check out the results. I see Indeed, Dice, Careerbuilder, Monster, WashingtonPost.com, and LinkedIn (which most people think is more job board that social networking site, btw). While Indeed is technically different “under the hood” from traditional job boards because it’s a meta/vertical search engine for job listings – it’s still a website with a bunch of jobs. Which is what job seekers – active, casual, and even some “passive” – want and need. It’s simply convenient to go to one or a few websites to search for and review jobs. What’s the alternative? Individually search 100’s to 1000’s of corporate websites? Label sites like Indeed and Simplyhired whatever you want, but you won’t change the purpose they serve. If you want to buy a car, you go where cars are sold. If you want to scope out potential jobs, you go where the jobs are. Yes, I know job boards are the root of all evil – but they actually serve a purpose, even if they’re imperfect and fail to serve that purpose as well as they could. There is nothing that social media can do to eliminate the desire and need to conveniently search jobs on websites that have the most employers and opportunities listed. When you go shopping, do you really want to go to a store that has a small inventory with a limited variety? Some people, maybe? Most people, no. It’s the people using social media and social networking sites to be social – to listen, engage, and interact in two-way conversations – that’s the “social” part. Unless recruiters and companies are using social media to have two-way conversations with potential candidates (instead of a one-way, one-to-many shotgun blast approach), social media isn’t any more “social” than a job board or a phone on the hook. 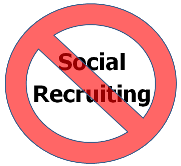 Now that I’ve drawn a line in the sand and delineated what Social Recruiting is NOT, I’d like to hear from you what you think Social Recruiting IS.